AVG Antivirus for Mac is developed by AVG Technologies, which is a subsidiary of Avast Software, which has acquired AVG in 2016. Originally, AVG was founded in 1992 in the Czech Republic as an antivirus provider. Today AVG has become one of the most popular and well-known names in cybersecurity industry and protects individual and business customers worldwide. The company provides solutions and software for Windows, Macs, and Android devices. AVG Antivirus for Mac is a free application, which does not include any other features outside virus scanner and real-time protection. The company also offers AVG Cleaner for Mac and AVG Secure VPN for Macs. AVG Antivirus for Mac supports Macs running OS X mountain 10.8 Lion or later. The installation of the program is simple and easy and can take about 8 minutes. 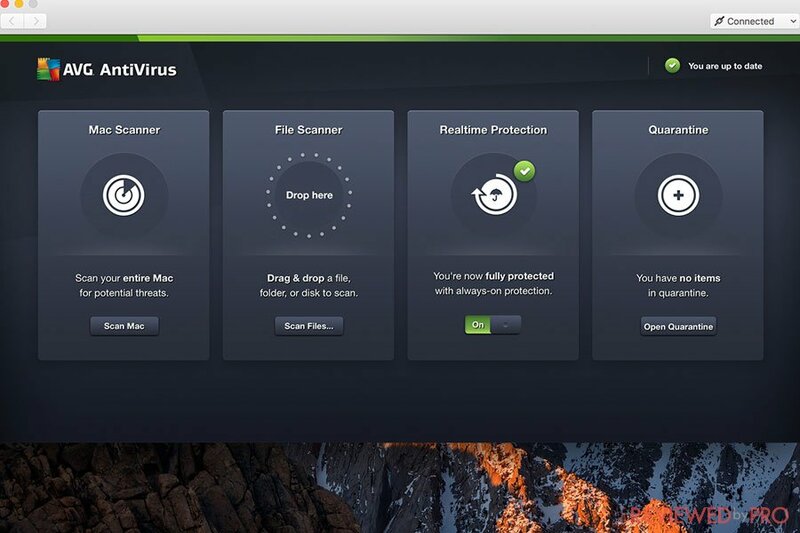 AVG Antivirus for Mac applies a traditional scanning engine that looks for suspicious codes and matches them with digital signatures of widespread malware. In addition, AVG Antivirus for Mac uses heuristic monitoring that looks for suspicious behavior of malware to catch unknown malware. AVG Antivirus for Mac was tested by an independent Austrian-based testing lab AV-Comparatives. According to the test results, AVG Antivirus for Mac provides nearly excellent protection. The antivirus program detected 99.9% of both widespread and zero-day malware. AVG Antivirus for Mac does not include any special features. As a free program, it is not a surprise. It also does not include browser extension, but you can download them for free from the other companies, such as Avast, Bitdefender, Avira or others. AVG Antivirus for Mac was tested by using the OpenOffice test. After the software was installed the test finished in an about 2.5 minutes longer than the operating system took before the AVG application was installed, which is 2.6%. In comparison with other products, for example, Avast Free Mac Security hit system by only 0.5%. During a full scan, AVG Antivirus for Mac hit the system by about 12%. The antivirus system-performance impact is relatively high. When it comes to scanning performance, AVG’s full-system scan took about 40 minutes which is an average in the market. The initial system-scan had a mediocre system-performance hit, however, an average user would not notice it. 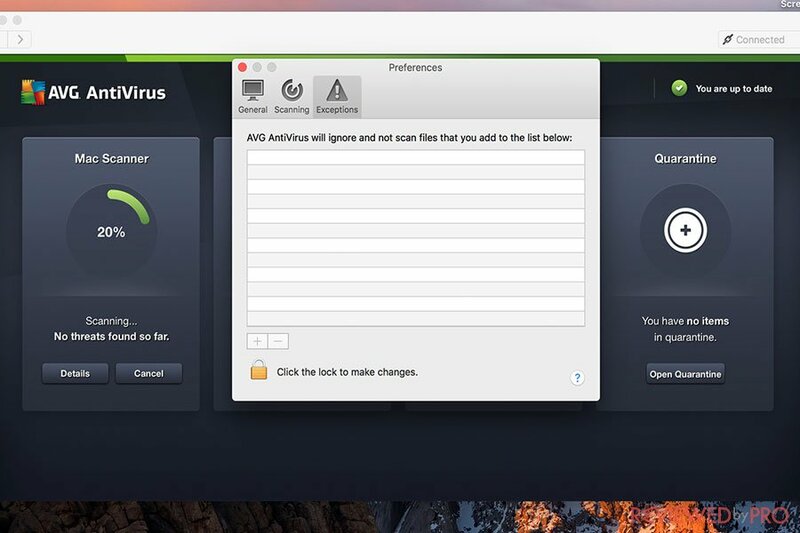 AVG Antivirus for Mac has a pretty simple and modern-looking interface. From the main window, users can perform a scan, open a custom scan options, such as specific, disable or enable protection and launch the quarantine folder. It also includes Preferences window that allows users to scan of archived files, external files, and shared folders. In addition, this window provides with an option to scan for potentially unwanted apps. As a free program AVG Antivirus does not offer any technical support via phone or live chat. 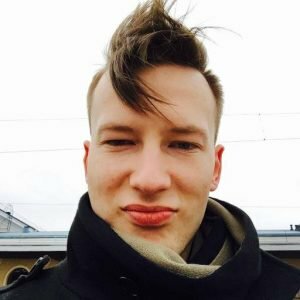 However, it is not an issue for a free program. The company offers Mac users AVG's databases and forums where users can browse to find answers and solutions to their problems. 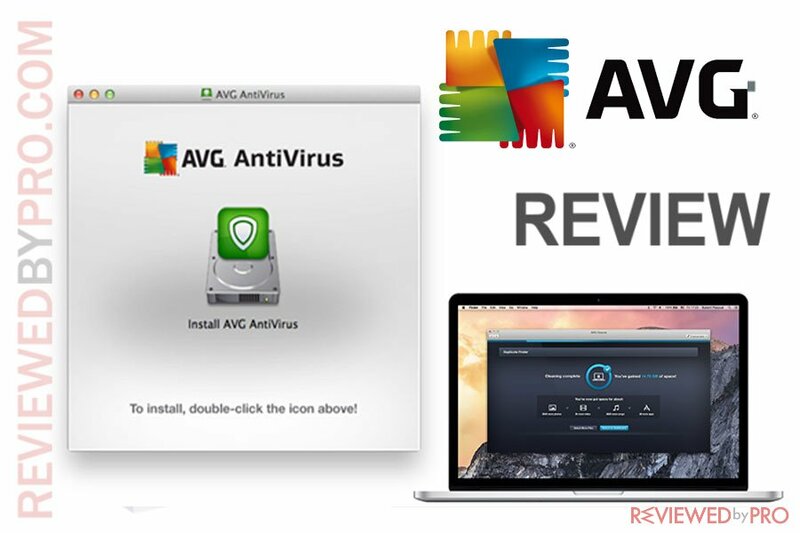 AVG Antivirus for Mac is a free application which provides award-winning antivirus protection. Even though it does not include any additional features, AVG would be a great solution for those who look for reliable antivirus solution for free. AVG AntiVirus for Mac offers one of the best malware detection rates on the market and has a very pleasant and straightforward interface. And does not cost anything! However, it has mediocre system impact and no additional features. ^ AVG Antivirus for Mac. AVG. This entry was posted on 2018-05-15 at 07:28 and is filed under Security.